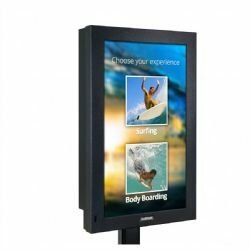 NEW SunBriteDS - Digital Signage - 32" outdoor, weatherproof LED-LCD touch screen, digital signage monitor - in portrait-mode. Commercial-grade Pro Series all-weather 32" DS-3214TSP with super bright LED-LCD screen & Enhanced Solar Tolerance (EST) technology to prevent isotropic blackout and direct sun applications. Complete with 3M Dispersive Signal Touchscreen and anti-reflective protection glass. Load-up an interactive map, menu or game to connect and entertain. The 32" portrait-mode DS-3214TSP features a powder-coated aluminum exterior - to defend against harsh weather ... multi-fan airflow system that keeps the unit cool & dry in temperatures up to 122 degrees F, full-HD 1080p, a type B" jack for Microtouch HID Touch interface and a two-year parts & labor warranty. This model is shipped with a weatherproof remote control and SunBriteDS Digital Signage operator's manual. NOTE: The DS-3214TSP does not include a speaker. It requires a separate detachable, weatherproof speaker module - the SB-SP47P - for crisp, high-quality sound. Please purchase the speaker if sound is required with this unit. 32 Pro Series True Outdoor All-Weather LED Touch Screen. DS-3214TSP. - Dispersive Signal (3-M Microtouch) Touch Screen Technology. - 400 NITS Super Bright LED with Extended Solar Tolerance technology.